To begin at the beginning, the first Full Moon Meditation I was able to join was the one in which Dahr Jamail told of his journey to bring an Earth Treasure Vase to Utqia?vik, Alaska. It was wonderful to hear about what he saw and experienced and why he decided to place a vase there. I very much enjoyed the beautiful meditation and strongly felt the light being sent to, and then from, all of the ETVs around the world. I could also feel the power of all the people—the circle was so strong, as if we enveloped Gaia herself in a protective cloak of light and healing. I was born in Massachusetts (USA) in 1950 and educated at Bates College (Lewiston, ME) and the University of Oxford (UK). 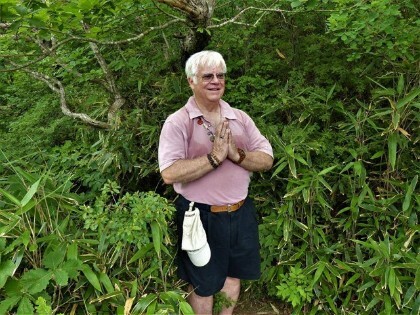 I have been living and working in Japan since 1974. I work for the Japanese Ministry of Foreign Affairs, in a semi-governmental branch that promotes intercultural exchange between Japan and the rest of the world. In addition, I am a lightworker/energetic healer using several modalities. I have been practicing Tibetan Buddhism since 1976, and have received several transmissions from His Holiness the Dalai Lama. In 2007 I became a Buddhist priest in the Japanese version of Vajrayana, called Shingon (meaning “mantra”) and in 2010, I underwent a 100-day intensive training and received the abhisheka initiation of the full transmission of the Dharma and was made an ?c?rya (ajari in Japanese) which is a Vajra Master with the certification to teach the Dharma, in which capacity I have performed healing ceremonies around the world. I love the Full Moon ETV Meditation because it has all the major marks of a great Buddhist practice: taking refuge, arousing bodhicitta, purification, offering, and dedicating the merit to all beings. After listening to Dahr and experiencing the ETV meditation, I was moved to write to Cynthia and ask if I might steward a vase. When Cynthia’s positive reply arrived, I was ecstatic! It is my intention to bring the vase to Fukushima, near the site of the nuclear meltdown disaster that resulted from the enormous earthquake and tsunami of March 11, 2011. The nuclear power plant has poisoned Japan (by covering the land with plutonium dust and possibly cesium as well) and the Pacific by leaking much radioactive material into the sea—and, despite denials by the government, it is still leaking. The situation is so critical that radioactive fish have been found on the western coast of the US. It is my intention to bury an ETV as close to the nuclear facility as possible. My prayers and intentions are for the vase to bring purification to the land and the sea – for the land to once again be usable and the polluted ocean clean. Each full moon when the meditation is held, I pray that the power in the vase will be increased hundreds of times to help to heal Gaia. This is a very good place for such a beacon of hope and healing! This one disaster continues to heat up the seas in the north Pacific and change weather patterns drastically, contributing to global warming. By burying an ETV near the source of the radioactive pollution leaking from the Fukushima facility I hope it will help alleviate all this. For me, placing an ETV there also has high priority right now because of the conflict between the US and North Korea, with Japan caught in between. I pray that an ETV here could help to relieve tensions between East and West and thus lead to more peace and harmony throughout the world. After being selected as an ETV Steward, I had to overcome the hurdle of how to get the ETV to Japan as they are ideally to be passed “warm hand to warm hand.” I was grateful when the Universe manifested a friend who offered to carry the vase from the US to Japan. 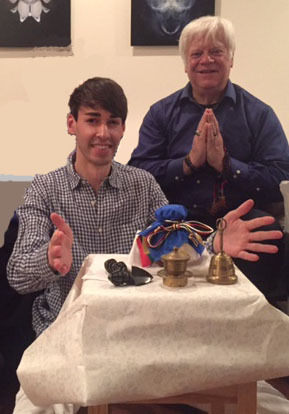 Doni Amoris served as the Vase Bearer, very carefully bringing it to me in Japan and hosting the first full moon meditation with the vase in his beautiful home-temple in Tokyo. That full moon was the Super Blue Blood Moon! Physically present with us were three men and three woman, all either Buddhists or lightworkers, and our meditation was awesome. Before we started, I performed a special ritual to re-consecrate the vase, during which I replaced the many items that had been placed inside by Cynthia and the Open Way Sangha (which had been removed to facilitate travel). During the time it took to slowly replace the items with our prayers, the group chanted the Heart Sutra in Japanese and then we joined with the global mandala as we practiced the Earth Treasure Vase Meditation. As soon as we started, we could all feel the connection with the grid created by the ETVs already buried all over the world. Three of us put other sacred items into the vase, and all of us offered prayers and placed our intentions inside the vase that Gaia be blessed and healed. The room seemed filled with a warm, radiant, and expansive light. Other friends from around the world also sent their prayers to the vase. 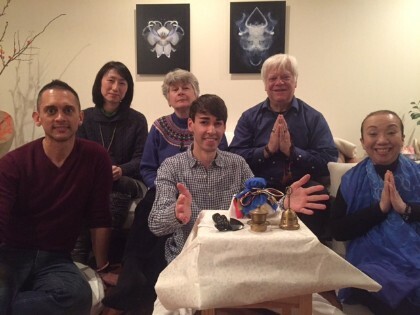 I named our group the Indra Net Sangha—a metaphor used to illustrate the concepts of Emptiness, Interdependent Origination, and Interpenetrating Connection of everything in existence. Recently the festival of Losar (Tibetan Year) took place, and the ETV almost demanded that I perform a ceremony! So I met with our precious vase bearer, Doni, and together we did a New Moon Meditation (for new beginnings), during which I offered sacred items, relics, amulets, incenses, and a vial of waters from about 250 sites around the world into the vase. It is said that ceremonies performed during an eclipse (which we had on Jan 31st) and Losar (on Feb 16th) and indeed during the whole first “Tibetan Month of Miracles” of the new year, are multiplied 100,000 times – so I felt very good doing a meditation ceremony then! Here in Japan, our next group meditation will be on the night of the full moon of March 2nd . It should be a very powerful meeting with a small group of about six or seven being joined by friends all over the world as we once again place our prayers and offerings into the vase. We will begin at 7 pm Japan time (2 am PDT/5 am EDT). I am sorry not to be able to join you on Cynthia’s live call this month but hope that everyone reading this will join us in spirit, sending your prayers and good intentions to the Earth Treasure Vase for Fukushima. I will hold mediations each month until the vase is ready to be buried in Fukushima, perhaps at the top of a nearby mountain overlooking the land to the east, toward the sea. I am listening deeply to receive guidance and instructions from the vase and shall do my best to be a good and faithful servant who carefully places the vase where it wants to go – at the perfect time. After many months of stewarding the Earth Treasure Vase for Fukushima, we planned to bury it on July 6th but because of a typhoon, torrential rains, and landslides the burial was postponed. The plan now is that I will be accompanied by two other Shingon priests, both of whom studied with me under ?c?rya S?jir? Sh?h? Kobayashi, who died in September of 2014. One other man, a very spiritual friend, will join us. The four of us are planning to bring the vase to the most sacred mountain in Fukushima prefecture (perhaps in the entire T?hoku region of Japan) on the morning of July 27th. Just by coincidence, it turns out that that day would have been Rev. Kobayashi’s 70th birthday. Fukushima ETV sealed with five elements amulet and birch bark pin. In anticipation of burying the vase on July 6th, on the 4th of July I placed the last gift into it and sealed the cork permanently. Then I added the five-colored silks and tied the five-colored cord around the neck to hold them in place. In lieu of sealing wax, which I did not have I used a special amulet from the shrine of a Japanese Yin-Yang master from a thousand years ago. It is a white pentagram on which is inscribed a white pentacle—the number five indicating the five elements of metal – water – wood – fire – earth. I used it in order to invoke all five elements to not only protect the vase, but also to all work together toward the healing of Gaia. 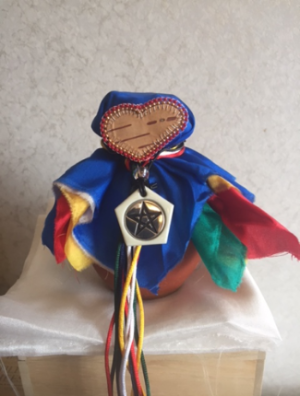 Then, above that, I attached a birch-bark pin given by a New England Native American friend; it is heart shaped, and by using it I hope to touch the hearts of all to take better care of our home, to open the hearts of all to peace, and to soothe Gaia’s aching heart. In the bottom of the box, I placed some sacred sakaki leaves and small cedar boughs. 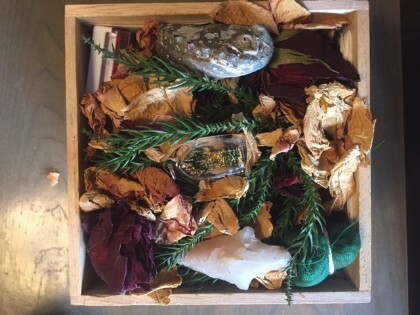 The vase was nestled into these and the rest of the box was filled with more leaves and cedar branches, dried flower petals from Cynthia, plus some offerings that would not fit into the Vase itself, such as a small abalone shell and a naviculite arrowhead. The ETV is currently on my altar with the box unsealed, waiting for one or two last minute additions. I plan to permanently seal it shut on the evening of July 26th Japan time. By the time of the Full Moon Meditation call, the ETV will already have been buried for about 20 hours. I look forward to sharing the story with everyone on the Full Moon ETV call. Please send your prayers for a successful burial pilgrimage in Fukushima! The date of July 27th was finally set for a group of four of us to carry the Earth Treasure Vase forth and bury it. However, a few days before, the Japanese weather agency announced that Typhoon Jongdari (No. 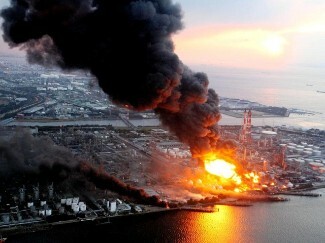 12) was scheduled to hit Japan at around that time! I prayed to the weather devas and dakinis and requested that the rains not hit the Fukushima region until the 28th, or, at the earliest, the evening of the 27th, and on the night of the 26th, I traveled up to Fukushima City by bullet train, so that we could get an early start on Friday, the 27th. We were blessed with good weather: partly cloudy and only 80° F, instead of the 90° F that we had been having for 2 weeks. Being cooler would make the climb easier, and, as we discovered, underneath the trees that covered the path much of the way, the breeze did feel cool. We filled our bottles with water, and got into our rental car, set the navigation, and drove off. But as we could not manage to set the navi to the exact spot, we had a little trouble getting there. With the help of a kind old woman who worked as a gardener at the nearby Children’s Camping Ground, we easily found our way to the parking lot at the foot of the mountain, where the hiking trail begins. We were very pleased to see that there were no other cars in the parking lot, so we hoped we would have the mountain all to ourselves. We said a short prayer and asked for permission to enter the mountain, and then took up walking sticks provided for hikers there, and set off. The group consisted of myself; two fellow Shingon-sect priests, ?c?rya Mr. Shin’ichi Itten Takahashi (Mr.) and Rev. Ms. Mika K?sui Nogoshi (Ms.)—both of whom had been students of the late ?c?rya S?jir? Sh?h? 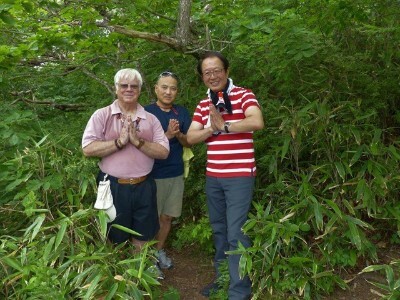 Kobayashi (Mr.) with me; and a very spiritual friend, Mr. Ken Miyamoto, who is most knowledgeable about mountains and sacred spots throughout Japan and who was quite familiar with this mountain. It was Mr. Miyamoto who informed me that this mountain is a pivotal spot: he told me that if we bury the ETV here, it will not only help heal Fukushima and the T?hoku region of Japan, but will go on to help heal all of Japan, East Asia, and all of Gaia Herself! We made a few stops along the way up, first taking in the beautiful view from the Observation Rock. We passed the place where tengu (mountain spirits) are said to have practiced sumo wrestling, and proceeded to climb up to the Gomadan (Rock Altar for Fire Ceremonies), an incredible natural formation, where we sat and recited the Heart Sutra three times, followed by some Shingon mantras and prayers. While we were praying, I felt three “presences” pass behind us and continue up the path, but thought no more about it. We continued climbing, sometimes over rather treacherous terrain where chains and ladders had been installed to help hikers—the path that led up to the Rock Altar is so dangerous that it is called “Path Where Parents and Children Forget Each Other Out Of Fear”! Soon we found ourselves in a large opening. Our path had ended. There were three possibilities on the opposite side of the field and we weren’t sure which way to go. The field indicated the spot where a small mediæval castle had once stood, and where there was a memorial to Imperial Prince Noriyoshi (1328–68, later Emperor Go-Murakami, r. 1339–68), who once traveled as a young child (1333) to this part of Japan with a force sent to defeat the warriors of a rival faction. To the right of his memorial was a small shrine in which many people have left prayers written on small boards. When we went to read the inscriptions, we noticed three old men (the same three beings I had sensed earlier?) sitting down and talking over rice wine and snacks. I remember thinking that they reminded me of Taoist immortals—but I think they were physical, because the others saw them, too. We apologized for bothering them and had no other interaction with them. I did, however, overhear one of them say to his companions, “That path leads to the highest point on the mountain.” I looked toward where he pointed and saw the path. Suddenly I knew that we had to go that way. So we drank some water and ate some dried fruit that Mika had brought, and climbed up to what was called the “Eastern Watchtower,” which represents the highest point of the mountain. On the way, we saw a dead hawk lying on the path. Some animals had eaten most of it and there were feathers everywhere. I was going to take some to add to the burial site, but was guided not to. Instead, I said a short prayer for the liberation of the hawk’s soul, and we continued on. With a little difficulty, we climbed up a huge boulder by holding on to a chain and made it to the top, but I was dismayed to see that the summit was a very rocky outcrop. It seemed that there was nowhere to bury the vase in the ground, and also no fissures in rocks or caves in which we might hide it. I could hear voices approaching, so we sat for a bit, when all of a sudden the same three old men appeared. We all nodded to one another, but no one spoke. There was a boulder that represented the highest point, and one of the men jumped on top of it and spread his arms like an eagle, then he jumped off and all three left by taking a path I had not noticed. They disappeared as quickly as they had arrived, leaving us wondering if we had actually seen them? Itten said what I was thinking—that maybe they were trying to show us something and we should investigate that area. 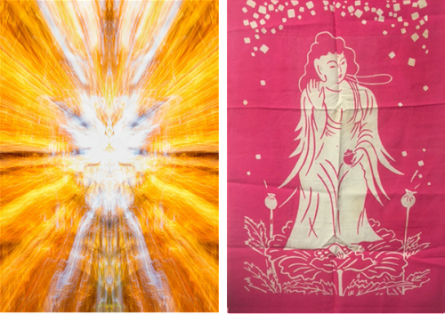 Whether these three beings were: a) deities or spirits living on and protecting the mountain; b) immortals who helped those on the mountain; c) normal human hikers who just happened to be in the right places at the right times; or d) none or all of the above, doesn’t really matter. What is important is that they led us to finding the perfect spot! We had also noticed that yellow butterflies kept appearing and pointing the way for us. We realized that butterflies are signs of transformation, of something being in the process of changing, of coming to a new life, and yellow butterflies indicate that one will meet a spiritual master. I like to think that those three beings were our spirit guides for the day. . . .
After they left, I walked a little ways down the path they had taken and noticed that there was lots of brush and undergrowth as well as several red pines and other trees. When I peered into the brush, I noticed that there was one tree in particular—a small red pine—that had a secondary trunk growing very close the ground and had a small space beneath it. We all knew immediately that it was the right spot and decided to bury the vase there. We dug a hole deep enough to bury the ETV-containing box, which I had encased in copper sheeting for burial, securely in the Earth. As Itten was digging the actual hole, I performed the burial ritual I had written, based upon Japanese and Tibetan prayers and traditions. The ETV seemed very happy not only to be sitting in the bosom of Mother Earth but also to be embraced by Granny Pine. We replaced the soil and broken roots, and packed it down tightly, after which we positioned several medium-sized rocks to hold the soil in place and prevent erosion from rain. I saved some of the soil for Cynthia, so that she might add small bits of it to future vases. When I was done, and the burial was complete, we lit two small candles and put them on each side of the spot, lit a stick of incense, and offered a wild mountain lily, placing it in the ground above the vase. Then we once more recited the Heart Sutra, followed by something called the Mantra of Clear Light and a few other mantras. When finished, we all stood briefly, extinguished the candles and removed them, and placed the incense upon a stone until it burned out. It was interesting that as we dug, we kept pulling glass bottles out of the ground—some whole, some broken—that once contained Coke, beer, and even whiskey. We dug up about a dozen of them. We could tell that they were very old; by shape, as well as by depth, we guessed that they must have been discarded by climbers some forty or fifty years ago. It felt as if each time we took one out the Earth, the ground seemed to sigh with relief. We carried them down the mountain, and I discarded them in a recycling bin upon returning home. On the way up the mountain, sometimes my backpack, which contained the vase, felt very heavy. I could not tell if it was because some forces were trying to prevent us from succeeding in our mission, or because it was such an important task we were doing, but because of the weight I felt quite fatigued and shared the carrying of the ETV with Itten, who helped carry it to the summit. We both felt the “weight” and it seemed fitting, that after bearing this sacred offering up the mountain, he dug the hole while I said the prayers and performed the ritual I had written for the burial. Upon leaving the site and beginning our descent, we suddenly found ourselves looking at what is called the Rock of Learning. 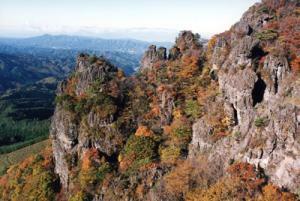 It is a large overhanging part of the mountain that forms a womb-like area beneath it that is directly below the burial site. Being mostly Shingon priests, it seemed to us as if the site at the summit on top of the overhang is the Diamond Realm, or the world of spirit, and where we were standing beneath the overhang was the Womb Realm, or the physical world, the place from which all Earthly phenomena are born. This gave us reassurance that we had indeed found the proper spot for the vase. We stayed within the energy of that “womb-like realm” for a long time, said a few more prayers, and then continued our descent. We passed a place where K?kai (774–835), the founder of Shingon Buddhism in Japan, is said to have split a large boulder into two parts. (I went in between them to feel the energy, which was very powerful.) We later passed a rock dedicated to Sarasvat?, the goddess of the knowledge, wisdom, and music; climbed the “Sunset” boulder on which the sun is said to set when viewed from the east; and finally explored the Wish-Fulfilling Gem Rock. Mika wanted to climb a nearby outcropping and have us take her picture climbing there, so we waited as she quickly scrambled up it like some female yeti. As we continued to descend, suddenly Mika stopped and said, “Look! There’s a snake!” It struck me as most bizarre, since I had just said, “Oh, I really hope we don’t see a snake on the way down!” I had forgotten that telling the Universe that you don’t want something has the same effect as asking for what you do want! It was slithering through the ground cover, and in an opening in the leaves I could see about 8” of its body. But it was moving rather swiftly and as I watched it go by I could count to 5, so I supposed that it was at least 4’ or more long. The body was thick, about 1.5” in diameter. Thinking I knew what kind of snake it was, the length indicated that it was a female; and the girth suggested that it might be pregnant. Its scales and striped pattern flashed with iridescence when the sunlight hit it, much like a rainbow trout. Mika was getting close to observe it, but thinking that it was venomous, I suggested that she not surprise it and that we should all move back and thank it for blessing us with its presence. 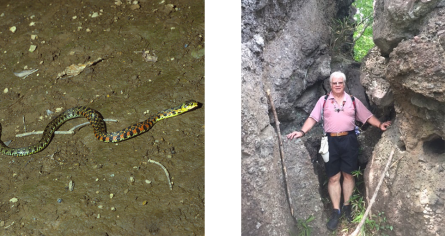 (I found out later it was a Tiger Keelback [Rhabdophis tigrinus], a type of venom-bearing colubrid commonly found in Japan’s mountainous areas.) Spiritually, snakes are connected to life force and primal energy as well as transformation. In Japan, they are also seen as messengers of the gods. So we were certain that the gods of the mountain had sent the serpent to thank us for burying the vase and for our reverence and also to give us their blessings and to confirm that transformation would result from the burial. It was interesting to note that the snake was also descending the mountain, almost as if leading us down and seeing us off. Humbled and blessed, we left the mountain and found our vehicle. For me, the rain did not start until I reached my home near Tokyo, about six hours later. And only seventeen hours after the actual burial, I was on a call with Cynthia and the global ETV community, still shaking with exhilaration, giving a shorter version of this adventure! One thing I told Cynthia after the full moon the call is that when we were burying the vase, I was moved to bury with it all the things that stood in the way of my taking the next step of being a vessel of light myself. It seemed in many ways that the Earth Treasure Vase and I had not only connected, but joined: the vase was in the Earth doing its thing, and I was on the Earth doing my thing. And one of the things I feel compelled to do now is to simply radiate the power of the Vase, the power of the Light, so that all who pass near me may feel its blessing. It is a very humbling experience, but one that I am enjoying. I can only give thanks for having been given the sacred opportunity to serve as steward for one of these incredibly powerful Earth Treasure Vases. It even feels as if burying the Vase was one of the reasons that I reincarnated again at this time and live in this place. E ma ho! A la la ho! May all karmic debts be purified, & may all beings attain buddhahood! May illness, harmful influence, obscurations, and impurities be purified! May all discrimination, all plague, famine, and warfare be pacified! May all man-caused pollution be neutralized, both land and seas cleansed! To protect this vase and repel all who attempt to dislodge it from the Earth. May all inauspicious bad omens for Japan and for the world be averted! That the Earth and all that dwell thereon may be free of all suffering. All who wish to bring harm or to cut short the breath of life, be repelled! May the eight great fears and sixteen lesser fears be overcome! For me and all those around me, may all that is inauspicious be averted! May the powers and strength of samaya-breakers and demons be averted! May all bad omens for this Vase, Earth, and all sentient beings be averted! This entry was posted on Friday, July 27th, 2018 at 1:25 pm	and is filed under Burials. You can follow any responses to this entry through the RSS 2.0 feed.